The CPI drives the IaaS and the Agent. 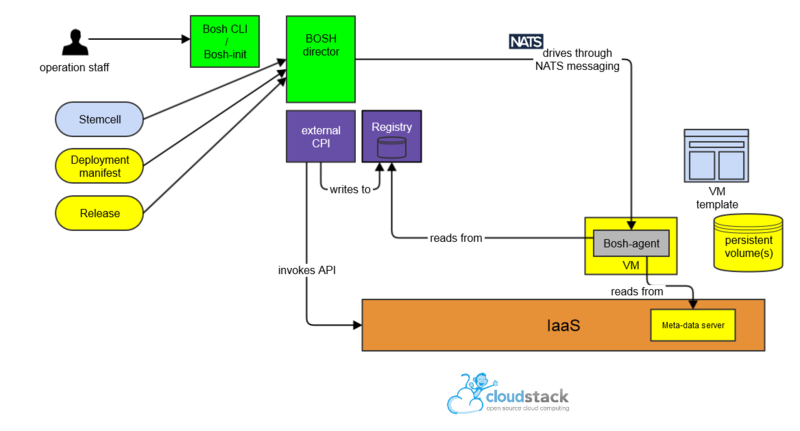 The Agent is initially driven by the CPI through the bosh-registry, and then by the Director through NATS-based messaging. The registry provides Director-side metadata to the Agent. If the CPI, Director and stemcell all support API version V2, then the use of Bosh registry will be avoided. In this case, the agent will be initialized with enough information to configure the VM and all communication with the director is performed through NATS server. This section details the configuration and protocols supported by the Agent. 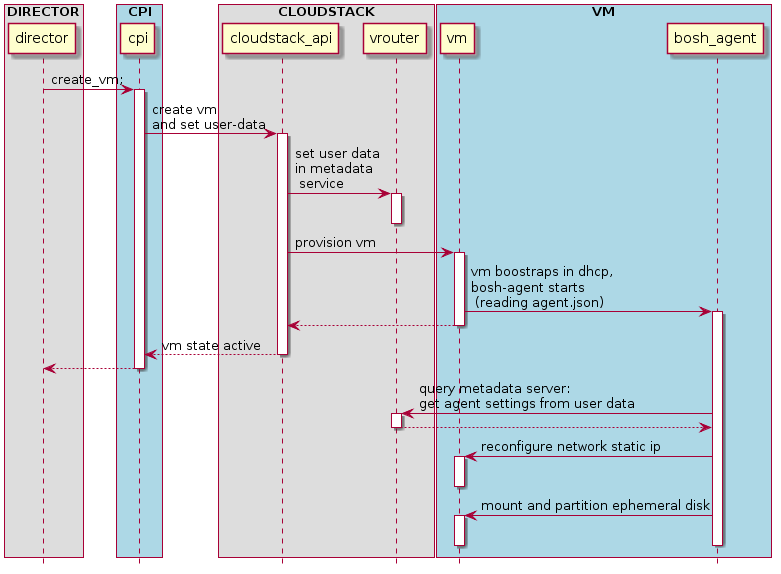 VM Configuration Locations provides a list of Agent configuration files and their roles. The metadata server initially serves the registry URL and DNS server list. The supported format of the metadata server by the bosh-agent is documented in UserDataContentsType and http_metadata_service_test.go, along with the expected behavior of the bosh agent when reading this config. As of CPI V2, the registry may be avoided if the stemcell API version is sufficient. See CPI API V2 and CPI V2 Migration Guide for more information on how the CPI, Agent, and Director behave in a registry-less environment. The registry provides bosh-side metadata to the bosh agent. The registry is used by the CPI to pass data to the Agent. The registry is started on a server specified by registry properties. If SSH tunnel options are provided, a reverse ssh tunnel is created from the MicroBOSH VM to the registry, making the registry available to the agent on remote machine. /var/vcap/bosh/settings.json: Local copy of the bootstrap settings used by the Agent to configure network and system properties for the VM. They are refreshed every time Agent is restarted. The settings.json payload format is the same as the settings format initially returned by the registry.